This recruitment presentation will be given by Vikki Horton, graduate recruitment manager at Citi, in London, UK. Global Transaction Services is a division of Citi’s Institutional Clients Group and the leading provider of integrated cash management, trade, and securities and fund services for multinational corporations, financial institutions and public-sector organizations around the world. 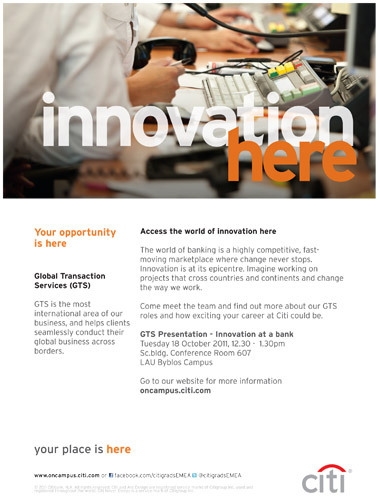 With a network of 22,000 employees in nearly 100 countries across the world, GTS provides organizations with a breadth of services, solutions and global expertise. Senior students and fresh graduates from all majors with an interest in the finance sector are invited to come and meet the GTS team and learn about GTS roles and career opportunities at Citi. To sign up, please call extension 2350 or email Rana Sakr, career guidance officer at LAU Byblos, no later that October 10, and provide your name, LAU ID number, major, and phone number. Please visit the http://oncampus.citi.com for more information.